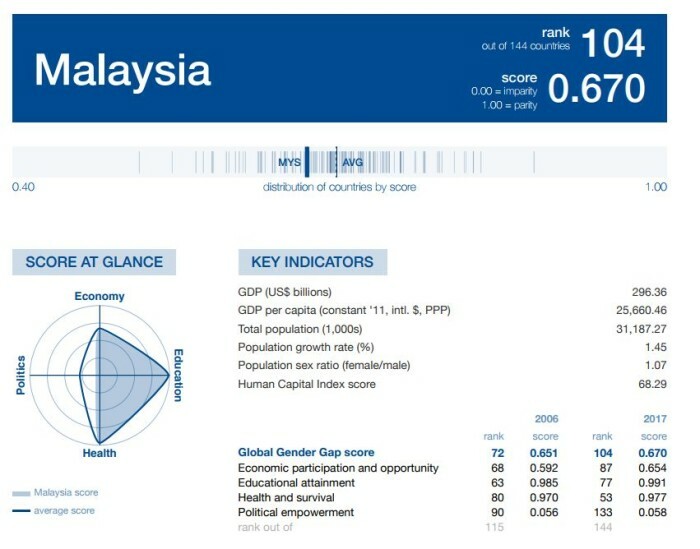 World Economic Forum has shown that Malaysia has ranked 104th globally in its latest Global Gender Gap Report. In comparison, the Philippines claimed 10th position making it to the top 10 list of the Global Gender Gap Index. With 1 being “not at all, significantly below those of men”; and 7 being fully, equal to those of men), the data is converted to a normalized 0-to-1 scale. On this, Malaysia scored 0.782. Measuring the proportion of the countryâs working-age population that engages actively in the labour market, either by working or looking for work, Malaysia ranked 105 (score: 0.651). However, this data doesnât take into account workers employed abroad. On another note, the report also measured the adult unemployment rate in the country. This refers to the share of the labour force aged 15 to 64 that is without work, but available for and seeking employment. 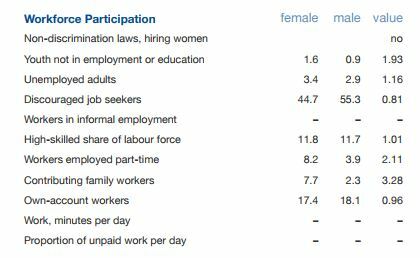 In Malaysia, females scored 3.4, with males scoring 2.9 – resulting in a value of 1.16 when it comes to adult unemployment in Malaysia. On economic leadership, Malaysia has no law mandates for equal pay. In fact, it scored 0.34 for firms with female co-owners, with a score of 1.4 for female employers (male: score of 2.3). However, on the bright side, Malaysia prime minister Najib Razak has mentioned in the Budget 2018 that it would be the Year of Empowerment of Women. Especially now that it will be mandatory to have 30% women in GLC’s board of Â directors, GLIC & statutory bodies before the end of 2018. 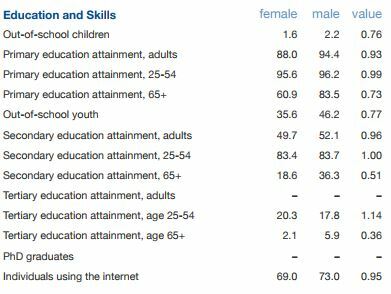 On the topic of education, there were a few degrees which saw a higher score for women graduates as compared to males. For example, in business, administration, and law (female: 24.7; male: 13.3); education (female: 21.6; male: 11.4); social science, journalism and information (female: 10.6; male: 8.9) and more. In comparison, Singapore ranked 65th has dropped its ranking from last year (2016) as the nation is reported to continue widening its gender gap in estimated earned income on the reportâs revised scale for this indicator. 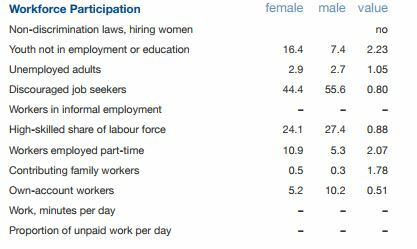 However, the country records small improvements elsewhere on the economic participation and opportunity subindex – most notably, on womenâs labour force participation and progression, including a multi-year trend towards near-parity in technical and professional workers. As for adult unemployment, Singapore scores 2.9 (female) and 2.7 (male) with a score of 24.1 (female) and 27.4 (male) when it comes to the rating of high-skilled share of labour force. The report benchmarks 144 countries on their progress towards gender parity across four thematic dimensions – economic participation and opportunity, educational attainment, health and survival, and political empowerment. In addition, this yearâs edition also analyses the dynamics of gender gaps across industry talent pools and occupations.